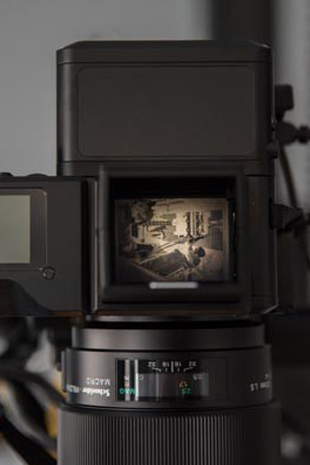 Back in 2015 we wrote our how to digitise glass plate negatives guide, where we offer our advice and best practice tips for digitising glass plate collections. 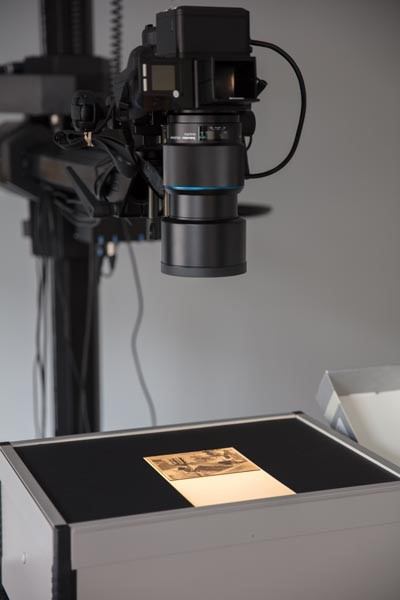 In the guide we referenced that there are two main workflows for digitising glass plates: one, using a flatbed scanner to scan them; or two – using a DSLR and lightbox setup to photograph the plates. 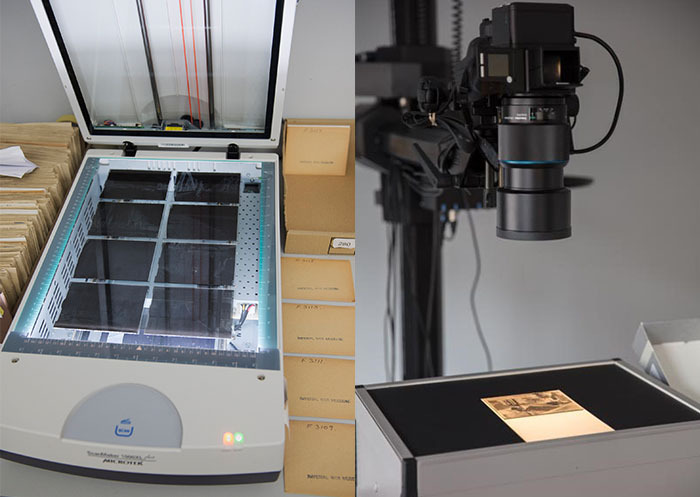 So for this special guest blog we have invited two glass plate digitisation experts from respected institutions, Ted Dearberg of Imperial War Museum London and Andrew Bruce of The Postal Museum, to contribute their views. Below they each explain a little about the collections they work with, the workflows that they use to digitise glass plate negatives, and why these workflows are best for their institution and goals. I am the Digitisation Suite Manager within the Visual Resources department at the Imperial War Museum London. My role is to oversee the scanning of the Museum’s photographic archive negatives and transparencies. I come from a print and traditional digital reprographic background in print advertising and newspapers, and started at the IWM in 2002 when we established our digitisation programme for the photographic collection. Our collection is made up of both glass plate and negative and transparency film dating from the First World War through to contemporary conflicts. Although we have some original glass plate negatives, the bulk of the glass plate material that we have digitised so far have been duplicates of film originals that were copied on to glass for preservation purposes. We began digitising in earnest around 2002 and it was very much intended to be for preservation purposes, i.e. to rest the negatives and alleviate the wear and tear that builds up with regular use from traditional photographic printing and duplication. At that time print media, rather than the web, would be the primary output medium for both internal and external clients. 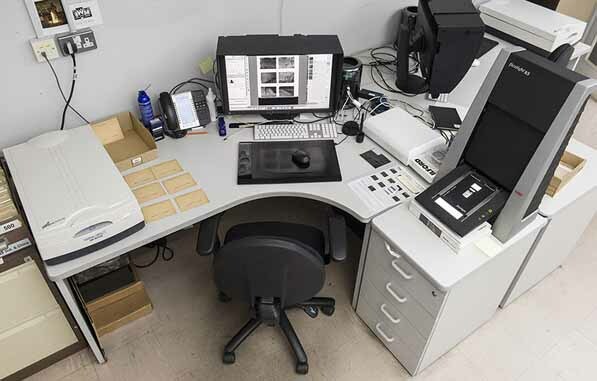 Image below: Digitisation suite at Imperial War Museum London – with the Microtek 1000XL flatbed on the left, Eizo monitor, Mac Pro and Hasselblad Flextight X5 scanner on right. Our aim when digitising archival photographic material is to create a “one size fits all” digital surrogate that will suit any potential output medium, but using the higher standards required for print reprographics as our benchmark. Given that traditional reprographics already had industry standards for file sizes, bit depths, colour management and file formats we simply adopted (and adapted) those to suit our “one size fits all” philosophy. It is also important to specify that our collection is a documentary archive. The photographic collection is seen as a collection of images rather than objects. Our focus then, is the high-quality reproduction of the image the negative contains rather than the accurate reproduction of the negative itself. So, for example, we would not attempt to accurately reproduce the colour casts that emerge from colour negatives and transparencies as they degrade over time. Instead we would allow the digitisation process to remove them giving us a digital file that is much more like the original would have looked when it was taken. This being so, the adoption of traditional print reprographics digitisation methods, which have always been aimed at accurate reproduction and optimisation of images, is a very good fit for our content. We scan glass plates on Microtek Scanmaker 1000XL flatbed scanners using Silverfast scanning software. We chose Silverfast because it can be used on most makes and models of flatbed scanner so if we change our scanners we don’t have to change our software or our workflow, or retrain our operators. Also, it has batch scanning and built in colour management profile creation software. 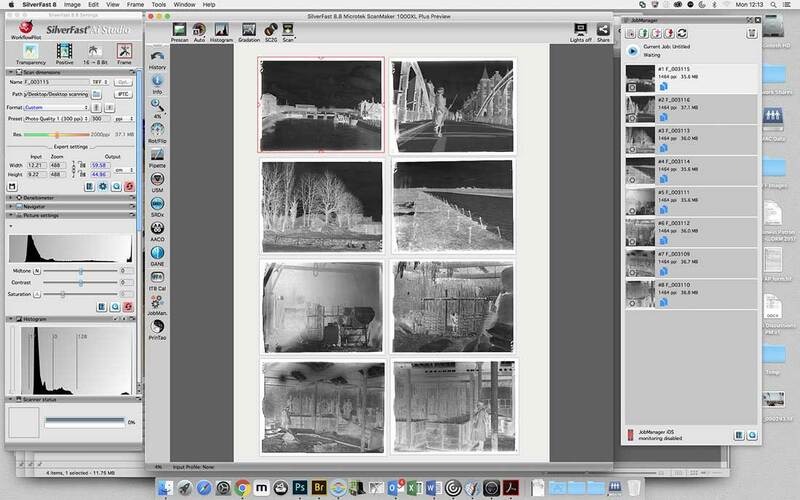 Image below: Screenshot of Silverfast software showing the scan bed ready to scan the batch of glass plate negatives. 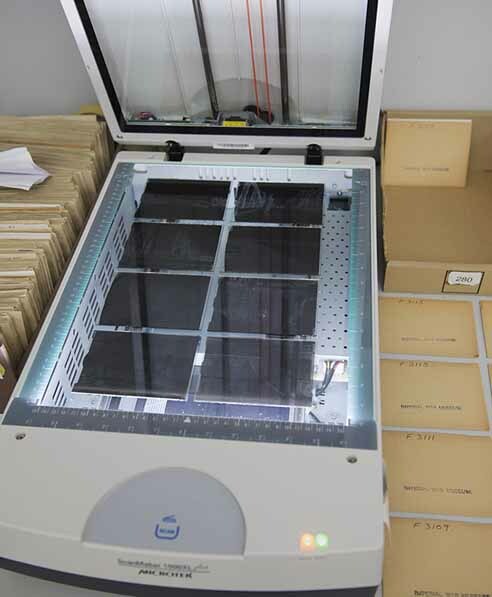 Why use a flatbed Scanner? It is perhaps worth pointing out that when we began our digitization program in 2002 digital cameras were not commercially available and consequently not an option. That said, for us the advantage of using a scanner workflow is primarily the ability to easily colour manage the workflow and ensure accuracy and consistency across input and output. 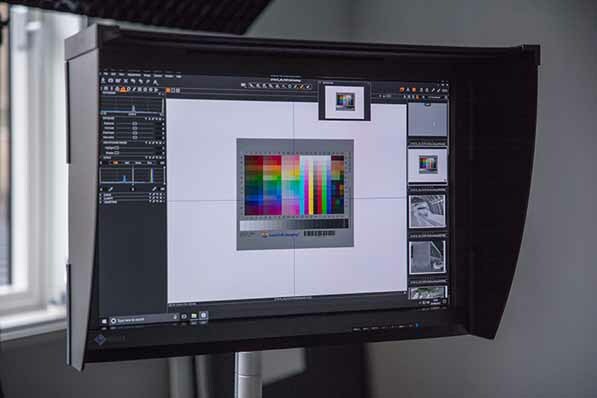 Colour management allows us to calibrate the scanners by creating an input profile for the scanner software which adjusts the Adobe RGB or Grey Gamma 2.2 profiles that we embed in each scan, something which can’t be done with a camera. Photography is essentially a process for controlling the capture of ambient light, whereas scanning is specifically for measuring and recording the image content of 2D material. In practice, it’s a subtle distinction given that, in this context at least, the processes and results seem so similar but for us at least it is simply the right tool for the right job. Doubly so because we do a significant amount of colour negative and transparency digitisation as well, a workflow for which photography is simply not an option. Over the years we have dabbled with camera capture but it has proved problematic in terms of quality and consistency particularly for damaged or over or underexposed negatives; where the camera accuracy suffers because it compensates for this by adjusting its exposure in a way that scanners don’t do. Another advantage for us is that while a scanning workflow requires expertise to set up its execution is relatively simple; requiring little or no expertise if you develop a good procedure and it is followed consistently. This has enabled us to engage volunteers in our digitisation projects, most recently our Official Second World War Collections Access Scanning project, which is producing between 600 and 1500 low-res scans per day. We capture glass plate negatives in 8bit monochrome, where possible scanning in batches. Batch scanning makes it possible for a good operator to run two scanners side by side and in doing so easily match or exceed a camera based workflow. The scanner software detects the darkest and lightest points in the image and aligns those with the darkest and lightest tonal values achievable in a digital file, with a little leeway for clipping (black and white points are set to 96% and 4% respectively). We then ensure that a linear curve is applied, which actually means no adjustment to the distribution of tone between those darkest and lightest points in the original. When the scans are done, we invert the image, size and crop the images to 20MB and set info droppers in the files to mark the highlight and shadow points. 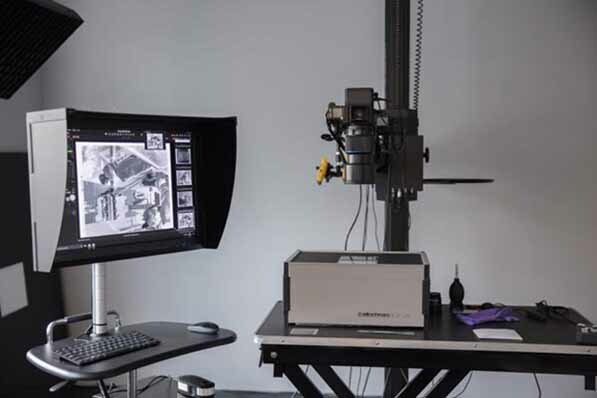 This allows operators to keep an eye on them during any subsequent optimisation or digital restoration to ensure that any correction or retouching does not cause them to clip. It is also potentially a handy thing for printers receiving the files, for similar reasons. 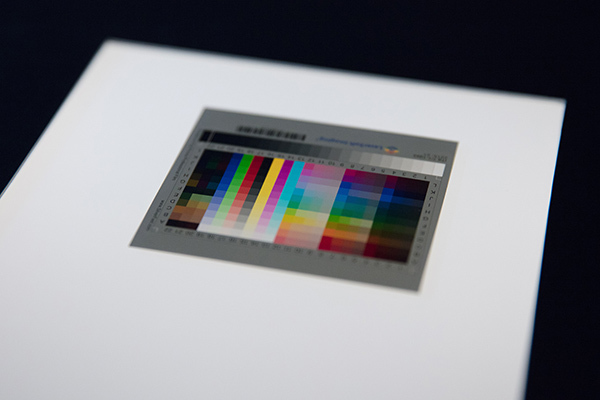 We scan to 20MB for monochrome and 50MB for colour images. Everything is scanned to produce 300ppi images because it is the reprographic standard and the highest resolution needed for any kind of reproduction, in keeping with our “one size fits all” mandate. We use TIFF for scans, master and delivery files; these are our Master Tiff files, from which all delivery files are produced. This equates roughly to A3 in size but we focus on file sizes in megabytes because this alleviates the need to specify both size and resolution. We use TIFF for scans, master and delivery files. Again, this is based on traditional reprographic practice where TIFF is industry standard. We did use high quality Jpeg for email delivery but files are usually delivered via FTP these days negating the need for compression. Another aspect of the files we deliver is the digital restoration we do to files for our exhibitions and which we offer as a premium service to both internal and external clients. This involves the correction and retouching of images this is highly skilled work that, in some cases, can take hours for a single A3 image. I’m Andrew and I run the digitisation studio at The Postal Museum. Alongside working with cultural heritage imaging, I also have my own art practice, I teach on various BA and MA Photography courses and I’m one of the contributing writers to the photography textbook Langford’s Basic Photography. In my personal work and in direct relation to this blog post I run a late 90’s drum scanner for making the very highest quality scans of film, so I have a very real interest in scan quality. The Postal Museum collection holds around 100,000 individual photographs. The collection includes glass plate negatives in a range of sizes, lantern slides as well as transparency and negative film from subminiature to 10×8” format. The General Post Office (GPO) Photographic Library began in the 1930s when the GPO required material for its nascent public relations activities. These publicity photographs, alongside the photographs from the Engineer-in-Chief’s Office, form the basis of the photographic collection. From images of sorting office machinery, to postmen travelling around the country, the collection shows the activities of the GPO, and latterly of Royal Mail and the Post Office, as an integral part of life in the UK. Our goal when digitising glass plates is to capture the clearest, highest quality image possible; whilst using a workflow that keeps the object as safe as possible. It is also important to us that, to ensure consistency in the outputs we produce, that every workflow is as precise, measured and repeatable as possible. What this means practically is developing a workflow that gives us great images, and recording every part of that process – from colour space to resolutions and image formats – so that it is measured and repeatable again and again. At the Postal Museum we use high resolution digital medium format cameras for virtually all of the digitisation work we do. From slide and negative digitisation, 2D artwork and document digitisation, book digitisation, and more. The three key benefits of using a camera to capture film and glass plate negatives that I would highlight are speed, flexibility and object safety. A camera captures the light passing through the film or glass plate in a fraction of a second making the scanning process incredibly quick. It takes me a minute to digitise each glass plate negative (including removing the glass plate from its box and sleeve, capturing it, typing in its finding number and repacking it) whereas a scanner is illuminating and scanning one line of pixels at a time so will always be consequently slower. Using an Epson Expression 11000XL flatbed scanner took me four and a half minutes to make a scan of a glass plate at the same resolution as the Phase One camera (and that was only the scan-time! Not even including handling time). Glass plate negatives (like pretty much anything glass!) are by their very nature fragile objects that we need to handle with extreme caution. The emulsion that coats one side of the glass and which forms the actual image on the plate is especially delicate and easily marked. When using a flatbed scanner the glass plate negative lies face-down on the scanners glass platen, resting on its actual emulsion, and then the illuminating lid of the scanner is brought down, concealing and sandwiching the glass plate inside the scanner. By comparison capturing using a camera is relatively low-contact, the glass plate is always in view and the emulsion side actually need never be touched as the emulsion side faces up towards the camera (with glass side resting on the lightbox) for capture. For glass plate and film capture specifically we use an Elinchrom ‘Box Lite’ lightbox, Phase One XF cameras with Schneider 120mm macro lenses and the IQ3 100mp back. Our camera is mounted on a motorised camera stand and our lightbox is placed on a solid motorised table. The 120mm macro lens is a necessity for focusing on something very small and very close and the focal length of the lens helps to keep distortion to an absolute minimum. The digital back we use utilises a CMOS sensor which allows the operator to very clearly see what the camera sees in real-time on the computer screen; ‘live view’ making composition and occasionally manually focusing the lens very easy. Images below: Left, Phase One XF DSLR setup to digitise glass plate negatives. Right, close up of glass plate negative filling the frame on the DSLR’s viewfinder screen. In all of our workflows we capture negatives as they are (in negative) rather than letting any software auto-invert the image at the point of capture as we want to be in control of every part of the process. 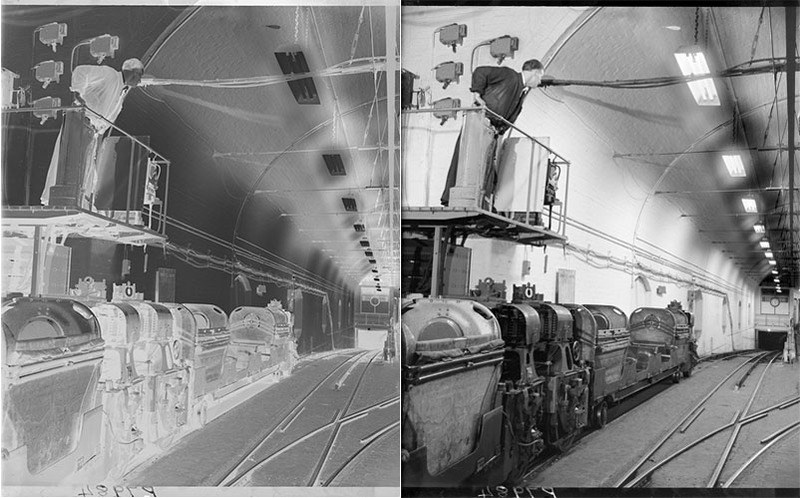 So first the focus is on getting the most accurate capture of the negative, we can then digitally invert the image later. Attaching your camera to a computer so you can control your camera and the images it captures; known as ‘tethered’ capture, is virtually essential when using your camera to capture negatives. What’s really important when photographing negatives is that you are using software that can render the image from your camera with a linear tone curve – that is – the software isn’t artificially adding any contrast to your capture. We begin nearly every job by capturing a target. When capturing film or glass plates the target we use is an IT8.7/1 produced by silverfast. This is a small piece of slide film that has 288 patches of varying colour and greyscale that is also supplied with various measurements of those colour patches (in CIE XYZ, CIEL*a*b*, Chroma and Hue) made using a spectrophotometer. One of the steps we have made to further improve the quality of our captures is to create a custom ICC profile from this target for the camera. As the exposure of the camera is variable (we can change the lightbox power as well as our camera’s ISO, aperture and shutter speed to let in more light or less light) we use the target to find and confirm that we are using consistently the right exposure for our workflow. Images below: An IT8.7/1 target on the lightbox being captured in order to find the correct consistent exposure and white balance. We have calculated that based on our specific target and working RGB space that the bottom left patch (when an eyedropper tool is hovered above it) must be 219RGB, and so a series of captures are made (turning the power of the lightbox up or down) until I achieve a capture where the bottom-left patch reads 219RGB in my capture. Still looking at my capture of the IT8.7/1 target, I then know that the most neutral patch on the target is the patch next to the bottom-left patch so I use the colour picker on this patch to neutralize my capture and set my white balance for all of the subsequent captures. As well as using the target to ascertain the correct exposure and white balance we can use the target to measure capture consistency and we also use it to calculate the resolution or ‘sampling rate’ of our captures. The box of glass negatives I was capturing while writing this blog were all 100x125mm in size. So for this I placed a glass negative, centred below the camera, and moved the camera down until the glass plate was pretty much filling the viewfinder window with 1cm gap around the glass plate on all sides. This meant that, thanks to my high-resolution 100mp camera, I was capturing an area of 12x14cm at a resolution of 2100ppi. If you had a variety of sizes of glass plates you might consider methods of capturing all of the like-sized plates together or whether time limitations meant that you should instead set the camera and lightbox to the distance required to capture the largest size glass plate and then crop in when it came to the smaller plates. At the Postal Museum we output colour negatives we digitise as eciRGB v2 16-bit Tiff files with the resolution embedded; and black and white glass plate negatives as Grey Gamma 2.2 16-bit Tiffs. A greyscale 8-bit image is made up of a maximum of just 256 levels of grey leading to banding, while a 16-bit greyscale image is made up of a maximum of 65536 levels of grey. We consider 16-bit colour depth essential; this really is especially important when working with negatives as the process of inverting digitally stretches and pulls the histogram apart. The resolution needed to scan various sizes of film and glass plates is a contentious and much misunderstood issue. Analogue images in their nature do not have a fixed resolution in the same way that digital images do and so the resolution that we capture at depends to be dictated by either the amount of data that the film holds or the maximum resolution of our capture device. For example, a 5×4” sheet negatives can easily hold enough data to warrant a 4000ppi resolution capture producing a file size around 2gb, however there are no cameras that can currently achieve this resolution in one single capture and only a handful of drum and flatbed scanners that can (truly) achieve this. As such. it’s generally either not technically possible or not practical to consistently capture film or glass plates at these high resolutions so a compromise of quality or productivity generally needs to be made. More generally the Federal Agencies Digital Guidelines Initiative (FADGI) Digital Imaging Framework provide their recommended resolutions (as well as bit depth, ICC profile and other imaging quality assessment factors): with four performance levels (1 star being the lowest performance and 4 star being the highest). For example, for formats 4×5” and smaller an 8-bit 1000ppi capture will merit 1 star, while a 16-bit 4000ppi capture will merit 4 stars. Once the negative Tiff images have been outputted, we then invert them to positive. At The Postal Museum we use ColorPerfect ColorNeg software to invert all of our photographic film and glass plate negatives. The sole purpose of this application is inverting negatives and it does a wonderful job of authentically simulating the characteristic curve of a black and white print and taking a level of subjectivity out of the inverting process. It’s to my knowledge the only software to do a satisfactory job of the much more complex task of inverting colour negative film; crucially while retaining the inherent contrast and colour response of that emulsion type. However using ColorPerfect is a relatively slow process so for large batches of black and white negatives it is favourable to use faster batch processes. For these occasions I have a Photoshop Action. Though ‘manually’ inverting negatives using photoshop or software like ColorNeg adds time and an extra step to the process we believe it’s worth it in terms of being in control of every step of the process, making sure you’re not clipping valuable data and retaining the look and feel of the film. Are you looking to digitise your glass plate negatives?